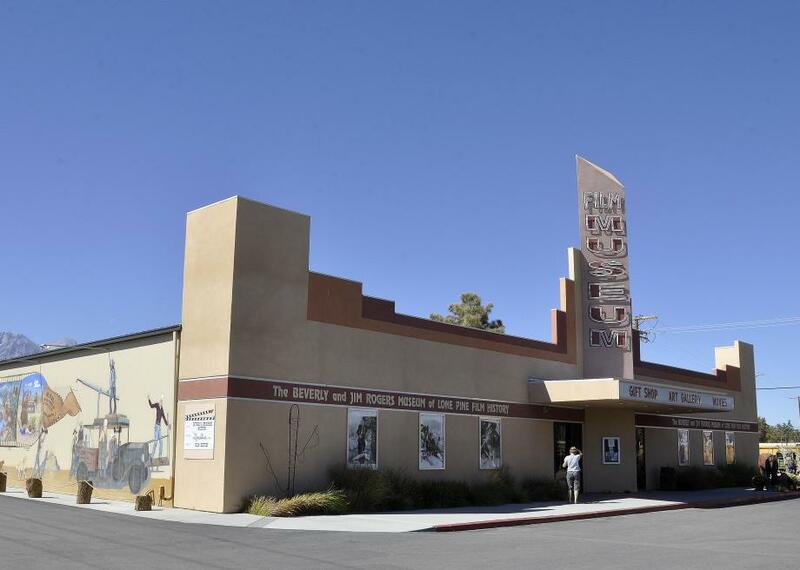 The Beverly and Jim Rogers Lone Pine Film History Museum commemorates the hundreds of Western movies and TV shows shot in Lone Pine, California. Two hundred miles and a 3½-hour drive outside of Los Angeles sits the town of Lone Pine, California. Nestled in the Alabama Hills of the Eastern Sierra Nevada mountain range, Lone Pine has served for almost a century as a destination for Hollywood filmmakers seeking sites for exotic location shooting. Starting in 1919 with the Western film serial Lightning Bryce, Lone Pine and its environs have appeared as the backdrop for genre classics starring Gene Autry, Hopalong Cassidy, and John Wayne as well as less successful revisionist Western fare like Kevin Costner’s The Postman and 2013’s box office bomb The Lone Ranger. The landscape has also doubled as the Himalayas in films like 1939’s Gunga Din, Spain in 2000’s Gladiator, and even outer space in science-fiction movies like Rocketship X-M from 1950 and Star Trek V from 1989. The Beverly and Jim Rogers Lone Pine Film History Museum celebrates the Hollywood history of the region. Within the museum, the history of film at Lone Pine becomes a stand-in for a broader history of Hollywood and the Hollywood Western. It traces the evolution of the genre through big stars like John Wayne and singing cowboys like Gene Autry and Roy Rogers. It recounts the movement of the genre from Tom Mix silent films and big-screen epics like Rio Bravo to B-Westerns like Gene Autry’s The Train to San Antone and more recent efforts like Quentin Tarantino’s Django Unchained. It also narrates the genre in terms of the development of technology from the coming of talkies in the 1920s to the coming of television as a domestic medium in the 1950s. These stories are told simultaneously through authentic screen-used artifacts, movie posters, and children’s toys, among other objects. As much as the museum outlines the history of a Hollywood genre and a history of media technology, it also maps broad currents of American history. The Western genre is a history of manifest destiny and the settlement of the region by white pioneers, but these films have also served as allegories of current events, and the museum bears this out too. This is especially evident in films of the 1950s that began to deal with developments in American culture like postwar alienation, Cold War paranoia, and, in the case of Bad Day at Black Rock, the Japanese internment that occurred during World War II. However, the museum also makes historical contexts evident when it looks at the genre’s representation of Asian and Arabic people through Edward Said’s concept of orientalism. This idea shows how Westerners construct nonwhite people through racist depictions of savagery and primitivism. At the Lone Pine Museum, visitors are encouraged to both tour the galleries and venture out into the hills and onto the locations themselves. This is, as the museum’s slogan argues, “where the real West becomes the reel West.” Indeed, the site intentionally juxtaposes fictional narratives with real spaces, highlighting the ways in which places are simultaneously fixed and mutable as they represent both 100 years of American history and futuristic science fiction. The museum thus teaches us how to see both time and space in new ways—ways that blend the past, the present, and the future through tangible objects and material geographies. Submitted by Atlas Obscura contributor Mabel Rosenheck. For more on the Museum of Western Film History, visit Atlas Obscura! The tree that owns itself. The oldest surviving bridge in New York City, abandoned since 1970.